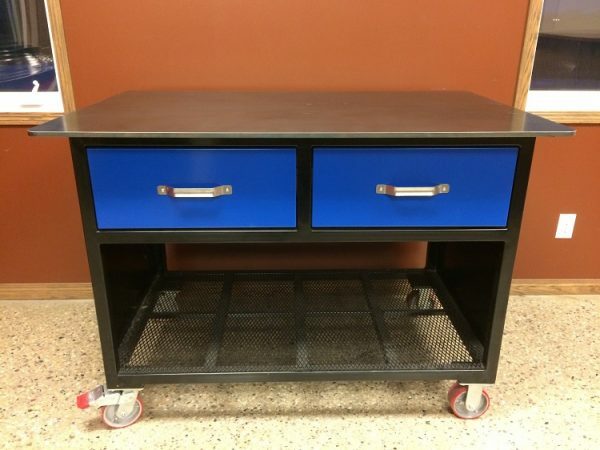 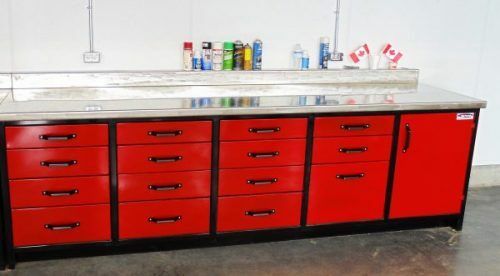 Our Canadian made heavy duty workbenches are crafted from Heavy Duty steel for quality that is trusted by professionals in shops across the continent. Our experts will work with you to get the perfect workbench configuration for your shop. 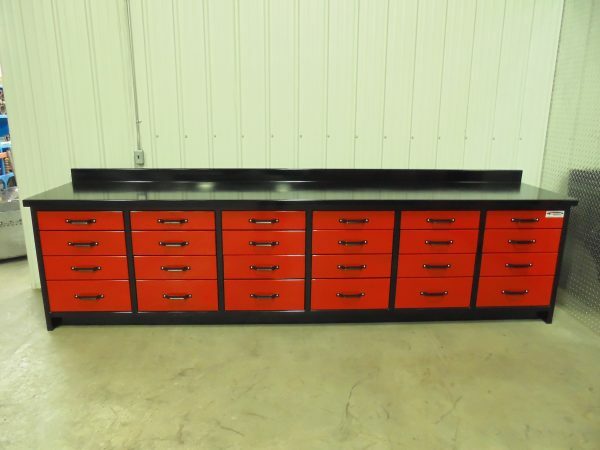 We do lots of custom designs to meet every need. 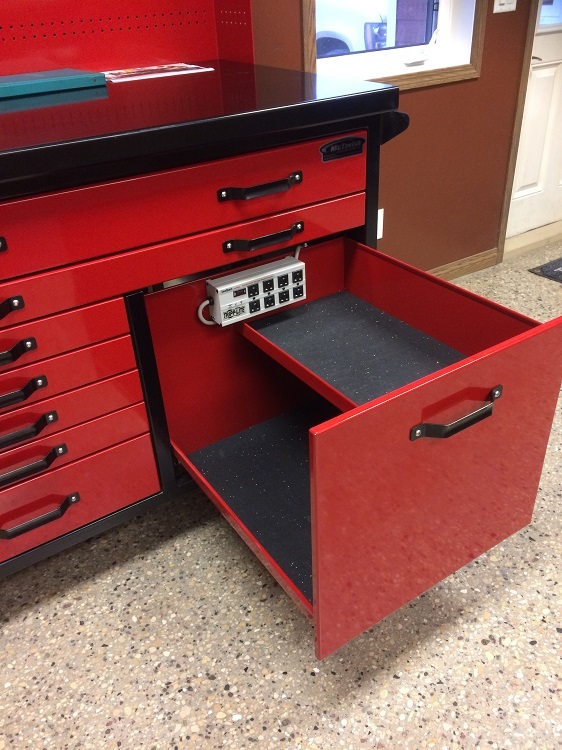 You can trust that while we’ve been around for many years, your workbench will be around for a lifetime! 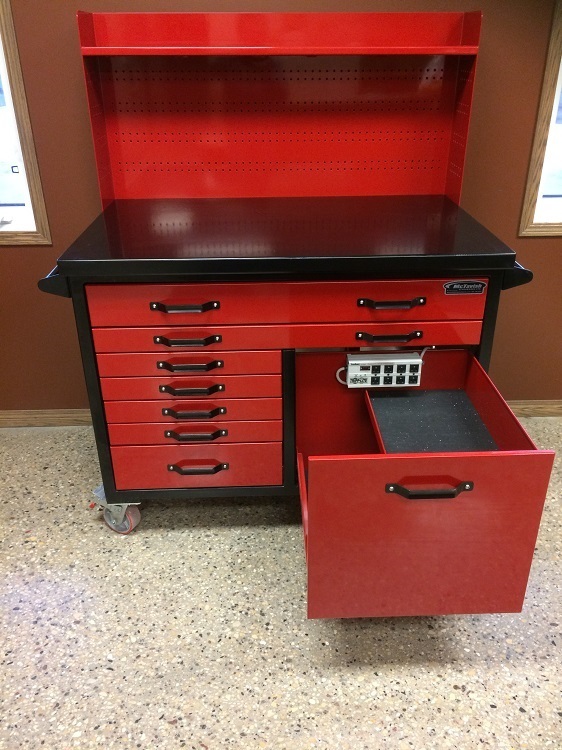 Contact Us for more information about any of our Products. 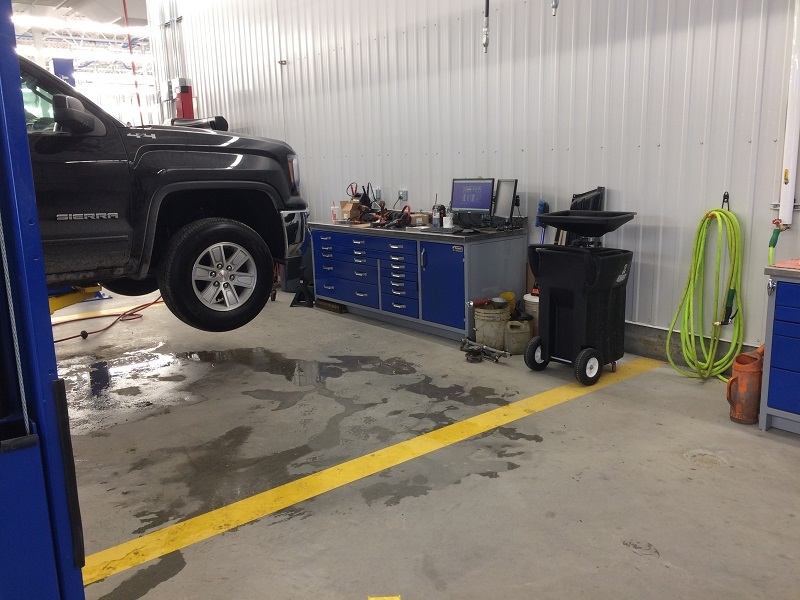 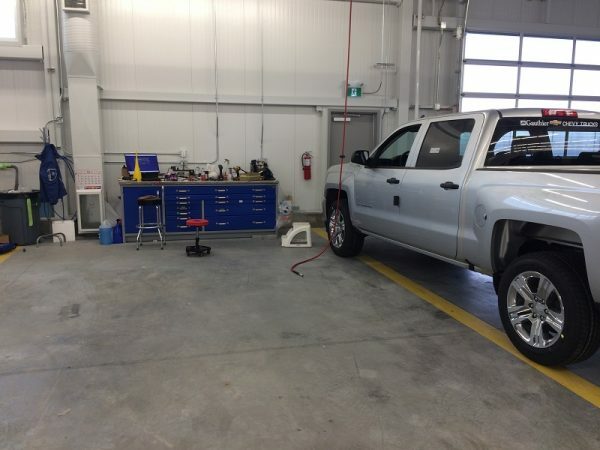 Check out some of our Farm Workshop customer installs. The top left image is 34 feet of workbench and is color matched to the customer’s John Deere equipment. 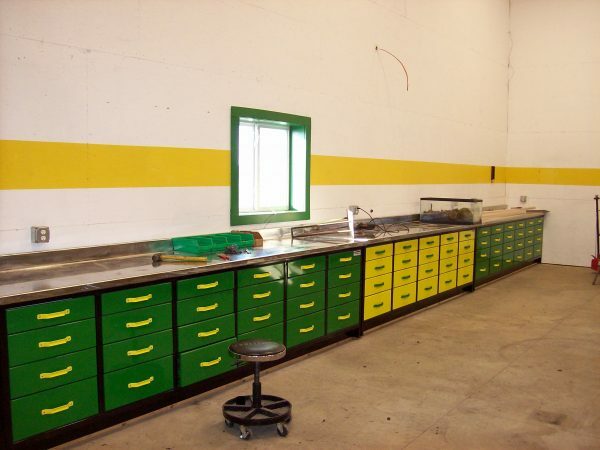 Yellow handles on green drawers and green handles on yellow drawers. Even the walls and window trim are painted to match. 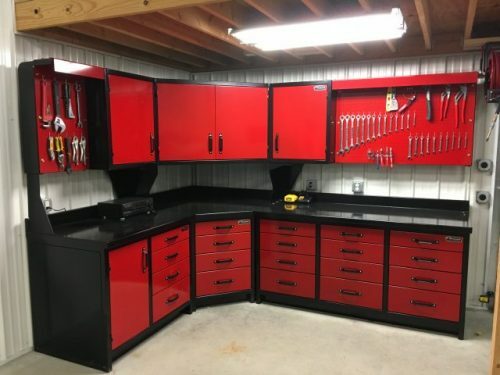 Upper cabinets and pegboard can be added for extra storage of tools or parts. 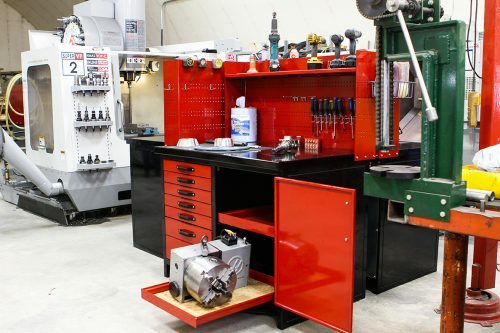 In the center picture you can see a steel vise attached to the workbench top, secure fastened. The heavy duty metal of the workbenches can take a heavy workload and still look in top shape. 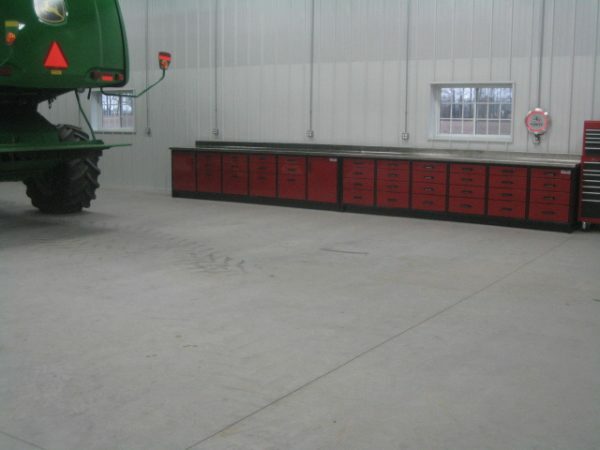 The top right picture shows a long continuous line of workbenches with their under worktop drawers and cabinets for tool and parts storage. 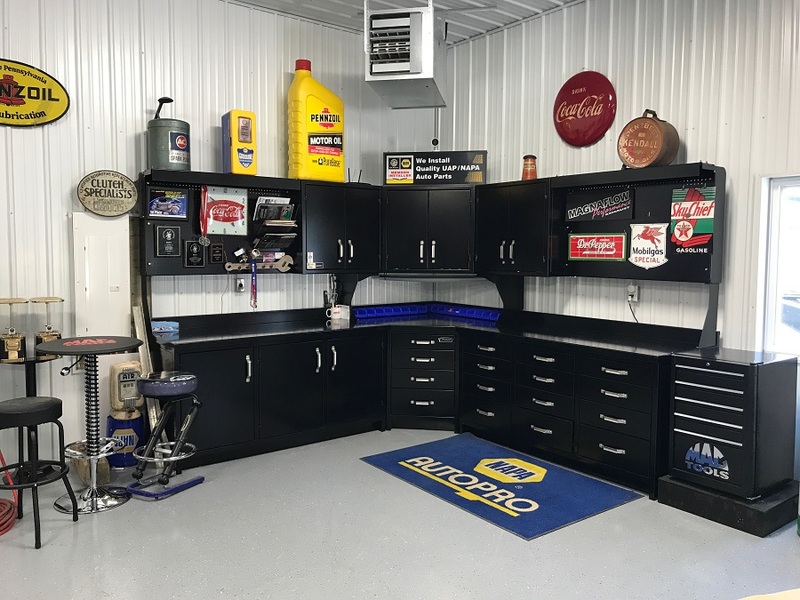 A great layout for where you have a long run wall space. 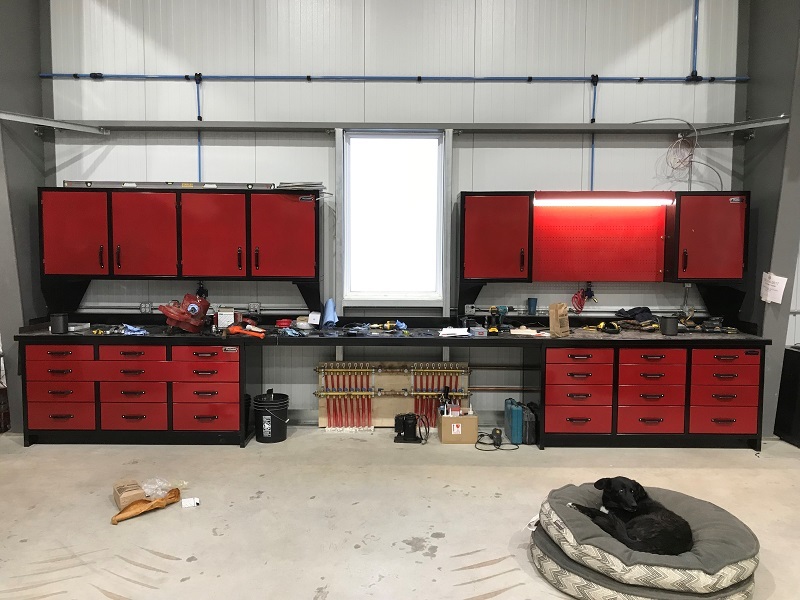 The bottom left image shows how nearly the same amount of worktop counter space can be placed in a corner to maximize the usable space and layout. This image also shows a full bank of Tool Cabinets hung above the workbench matching the corner configuration, including pegboard tool hanging sections. The lower middle image is a 12 ft workbench featuring our Iron Gray colored drawers in a black cabinet. 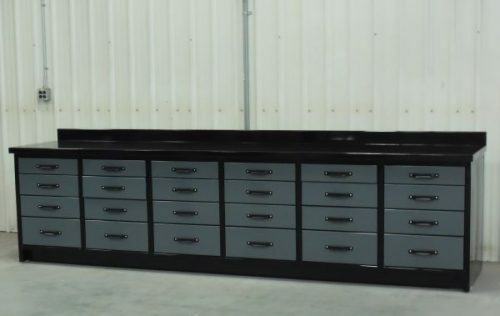 The last image, bottom right is a black workbench with stainless steel handles and a stainless steel work surface, featuring the 90 degree corner unit and lower cabinet. 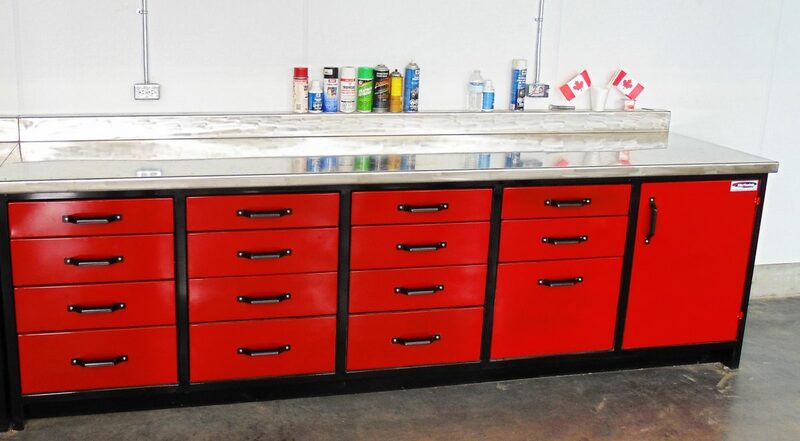 Great looking workbenches in classic styling. 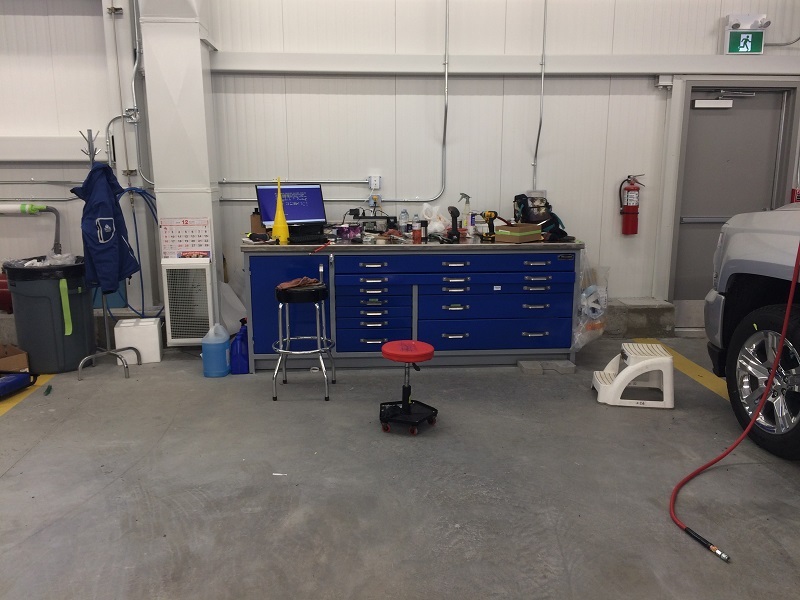 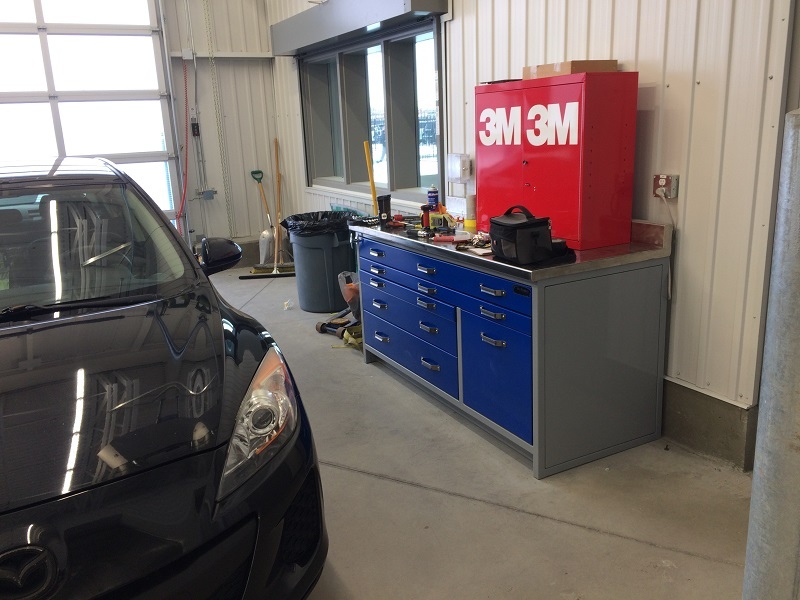 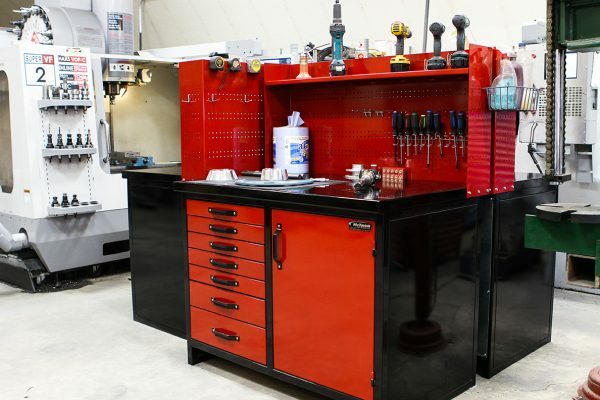 Our Mechanics workbenches are designed to maximize tool storage and easy tool access. 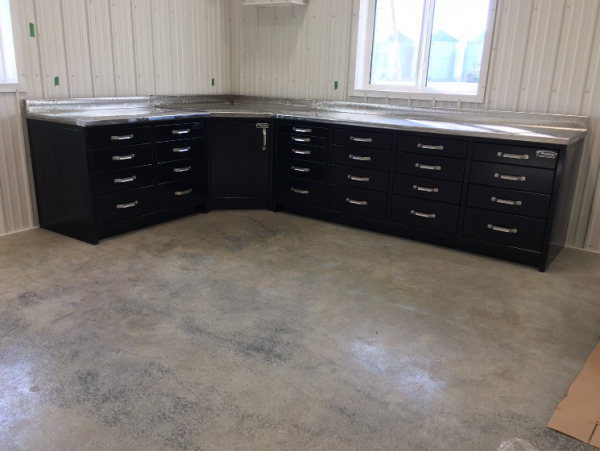 With many drawers of various sizes, we can accommodate a huge array of tools needed to perform a huge array of rebuild and repair activities. 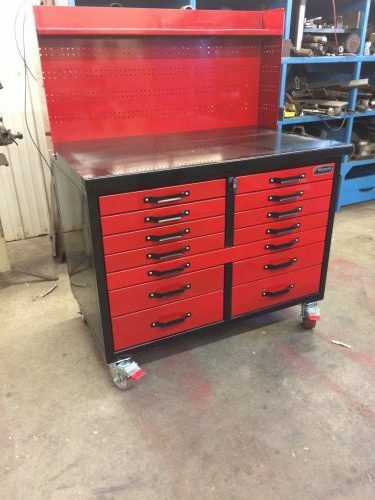 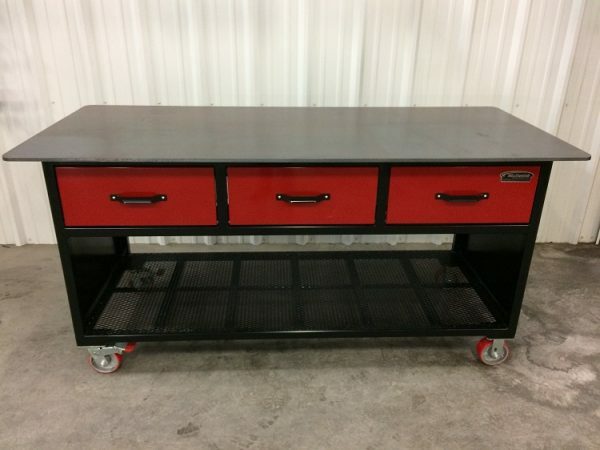 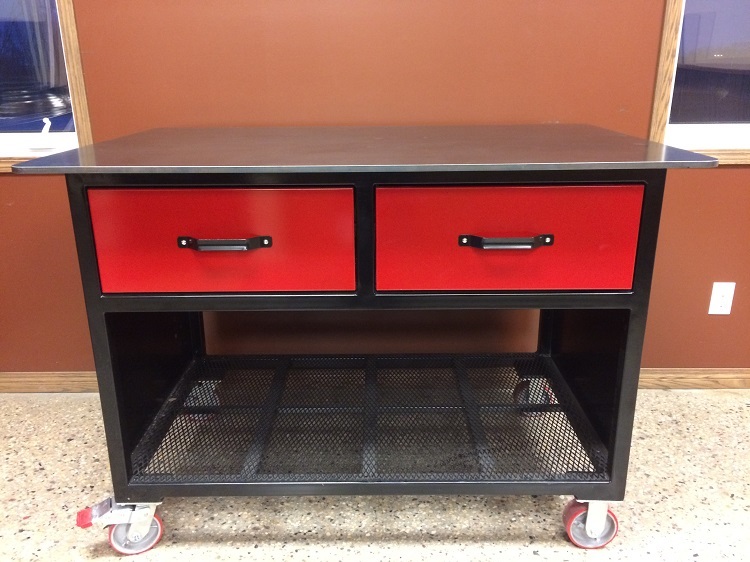 Colour choices are often made to match the company color schemes but we find that red is the most popular colour choice for mechanics workbenches. But feel free to pick your own colours. 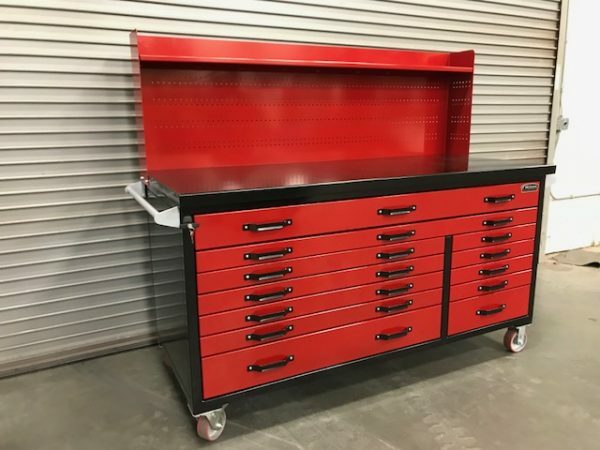 The images above show off a variety of configurations, especially drawer configurations such as deep drawers for power and impact tool storage and wide low drawers for hand tools such as wrenches, pliers, screw drivers and sockets. 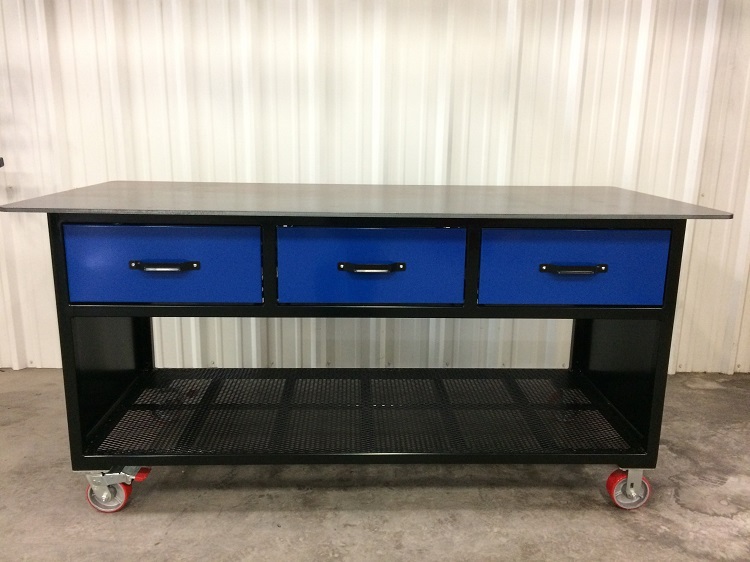 A common feature on most of the Mechanics workbenches is to have out heavy duty locking caster wheels so that the workbench can be moved to be close to the job in progress. 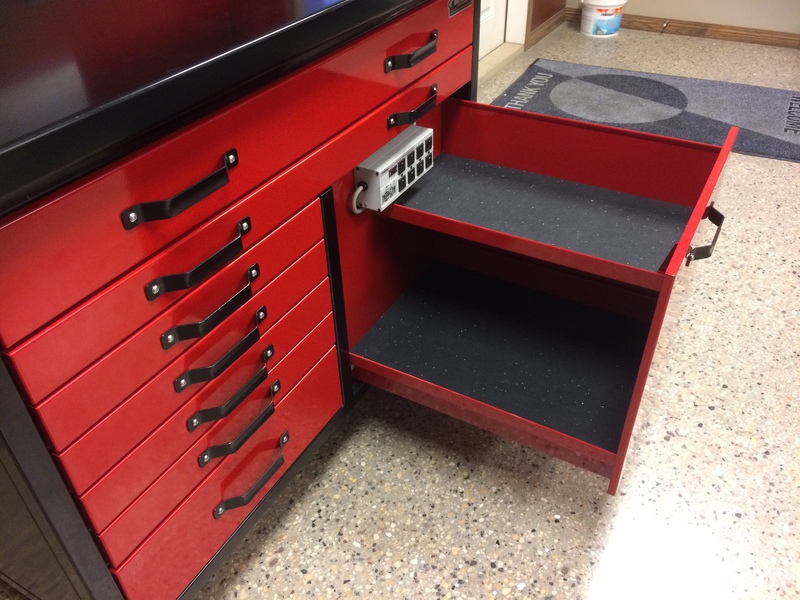 Also popular is a pegboard upper cabinet for hanging commonly used tools. 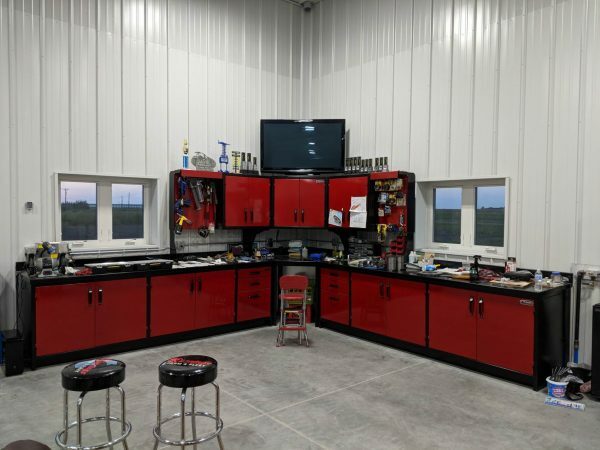 For all the home mechanics, our Home Garage Workbenches often reflect the owner’s personal style and offer a variety of storage options, from upper cabinets for parts to large doors and drawers for large tools to smaller drawers for many hand tools. The heavy duty workbench counter tops can take a pounding, from automotive parts rebuild and repairs to woodworking projects. 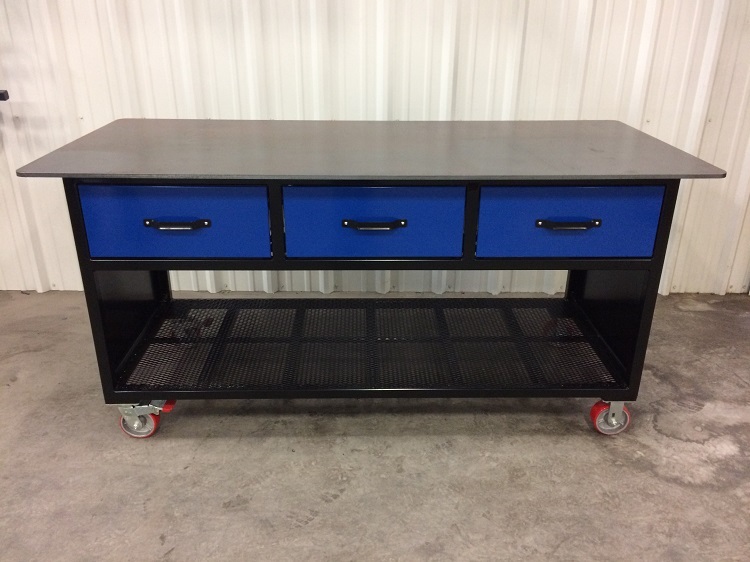 For the true test of heavy duty workbenches our Machine Shop customers really put our products to work. 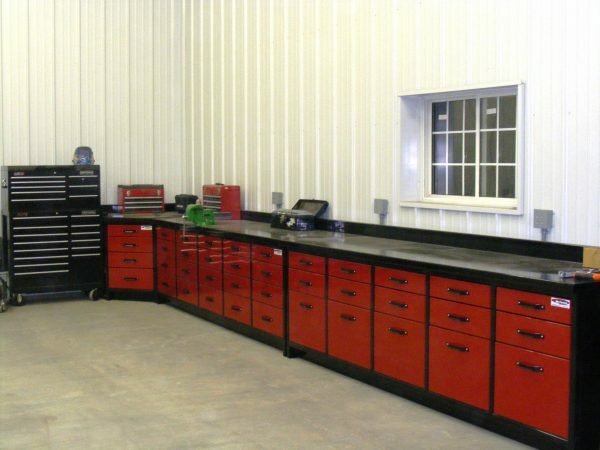 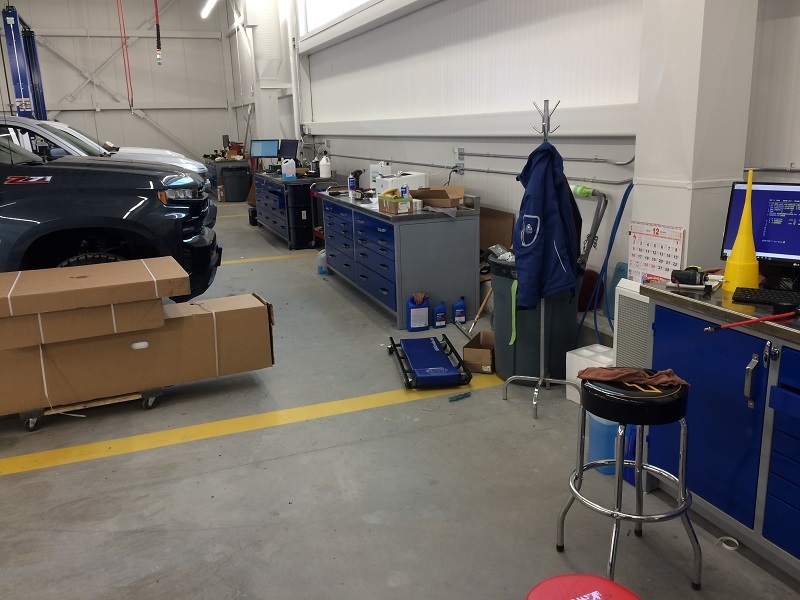 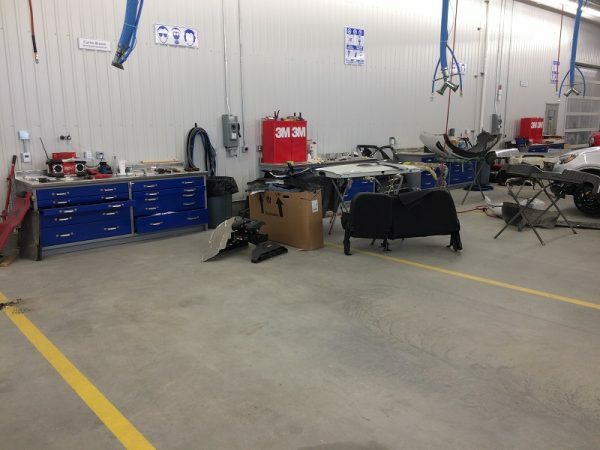 They have large storage areas for parts and power tools and plenty of easy access storage for hand tools and component parts. 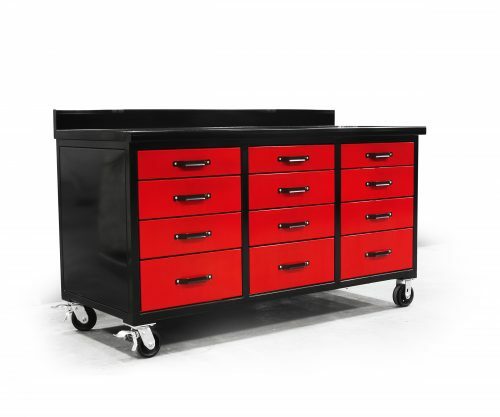 Colors can be matched to company color schemes or to personal style preferences. 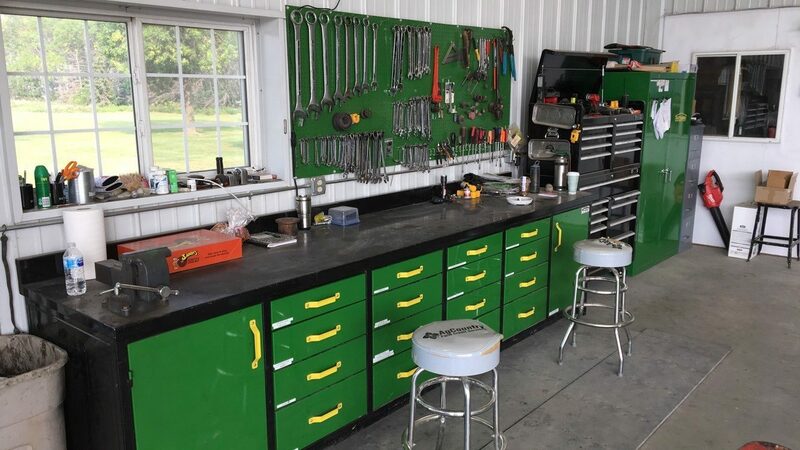 The image above shows the holding capacity of our slide out shelves and the upper cabinet pegboard holds an assortment of screwdrivers for handy access to frequently used tools. 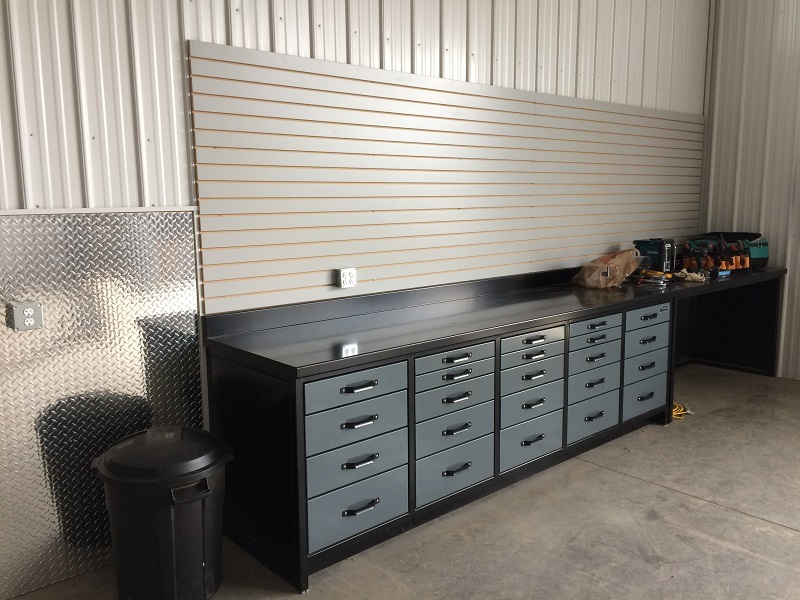 The shelf above the pegboard is another convenient place to store small power tools, keeping the clutter off the workbench surface while still keeping them readily available.